We believe that mine safety and continuous improvement are the foundation of responsible mining and metal production at Doe Run. Doe Run’s two mine rescue teams practicing their mine safety and rescue skills underground. Our long-term success depends on us achieving high standards of both at our operations. We’re proud to have our operations and employees recognized within our industry for safety and operational excellence. Seventeen Doe Run employees make up two mine rescue teams that serve as emergency responders for our Southeast Missouri Mining and Milling Division (SEMO). 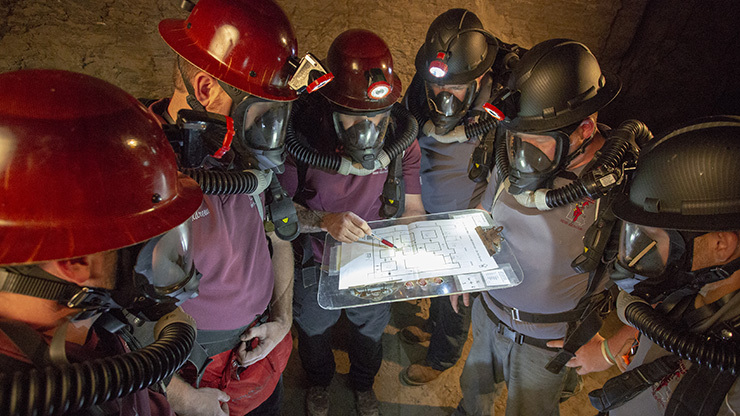 Doe Run’s Gray and Maroon mine rescue teams compete year-round in competitions that hone their safety skills, so they can help their fellow miners in the case of an emergency. Delivering on environmental performance and quality product commitments for our communities and customers is important. One way we demonstrate our commitment to performance is through International Organization for Standardization (ISO) certifications for 10 of our facilities. View awards received since 2013. Filter awards by year. Brushy Creek Mill achieved 12 years with no lost‑time accidents. Doe Run’s Southeast Missouri Port achieved 12 years with no lost‑time accidents. The National Safety Council’s Perfect Record Award recognizes facilities for creating a safe work environment. Doe Run’s Maroon mine rescue team placed Second, and the Gray team placed Sixth, out of 43 teams in the Field Competition. Steve Setzer was inducted into the National Mine Rescue Hall of Fame. Doe Run’s Gray mine rescue team won First Place in the Field Competition, First Aid Competition and Team Trainer Competition. Doe Run’s Maroon mine rescue team won Fourth Place in the Field Competition. Doe Run’s Gray mine rescue team won First Place in First Aid. The Maroon team won First Place in Team Trainer and Fourth in the Field Competition. The Above and Beyond Award is presented by ESGR State Committees to recognize employers at the local level that have gone above and beyond the legal requirements of the Uniformed Services Employment and Reemployment Rights Act by providing their Guard and Reserve Employees additional, non-mandated benefits. Sweetwater Mill achieved 20 years with no lost‑time accidents. Doe Run’s Gray mine rescue team won the Overall Championship, First Place in First‑Aid, Second Place in the Field Competition, and Third Place in the Technical Test. Doe Run’s Maroon mine rescue team won the Overall Championship, First Place in the Mine Rescue Competition and Third Place in First‑Aid. Doe Run’s Maroon mine rescue team won Second Place in the Mine Rescue Field Event and Second Place in First‑Aid. The Gray team won Third Place in First‑Aid. Doe Run received the award for its 2016 Sustainability Report website. The National Mining Association program recognizes mining companies with the greatest number of employee work-hours without injuries that result in lost workdays. Doe Run and its predecessors have received 28 Sentinels of Safety Awards since 1971. Brushy Creek Mill achieved 10 years with no lost‑time accidents. Doe Run’s Maroon mine rescue team won First Place in the Field Competition, Best in Association and Second Place in First‑Aid. The Gray team won Fourth Place in the Field Competition. The President’s Award for Commitment recognized Resource Recycling for maintaining ISO certification for 20 years. Resource Recycling received the Supplier Award in the Metals Category from Winchester Ammunition. Doe Run received the award for its 2015 Sustainability Report website. FPI achieved 1.5 million hours without a lost‑time accident. Doe Run’s Maroon mine rescue team won Best in State at the annual competition. Doe Run’s Maroon mine rescue team won the Overall Championship, First Place in the Field Competition, Second Place in First-Aid, and Second Place in the Technical Test. Doe Run’s Gray mine rescue team won Third Place in the Technical Team Competition. Doe Run received the award for its 2014 Sustainability Report website. Doe Run’s Maroon mine rescue team won First Place Overall. The Gray mine rescue team won Sixth Place in the Field Competition. Doe Run’s Maroon mine rescue team won First Place in the Technician Team Competition and Second Place in the Field Competition. Doe Run’s Maroon mine rescue team earned the Best in State trophy, First Place in the Technician Team Competition and Second Place in the Field Competition. The Gray team won First Place in First-Aid and Third Place in the Field Competition. Doe Run received the award for Continuous Improvement in Manufacturing Excellence from Missouri Enterprise, which recognizes companies that contribute to the success of Missouri business and community/state economic development. Two Doe Run Mines, Buick Mine and Mine #29 received this most prestigious mine safety award in the nation. SEMO achieved 3 million safe hours without lost-time accident for the third time in its history (1989, 1996 2012).